Le Petite Chateau is a charming and beautifully decorated treehouse nestled on the side of Early Moon Ridge at The Candlelight Forest in Chickamauga, GA . Only 20 minutes from downtown Chattanooga, by way of a pastoral drive through the Chattanooga Valley, these accommodations are perfectly located to take in Chattanooga and the many surrounding attractions that abound nearby, including Cloudland Canyon State Park, Rock City, Ruby Falls, and The Chickamauga National Battlefield Park. Perched in a beautiful canopy, Le Petit Chateau is built on a sloping ridge and provides for very safe and easy access, as its entrance is at ground level. Decorated by Atlanta design student, Sarah Grace Tatum, the theme is French Farm Rustic. A very airy and fresh theme, nuanced with old timbers and reminders of the Old World in the art and thoughtful knick knacks, helps transport you from the cares of everyday life. Upon arrival, a short stroll through the woods (and after dark, under near-magical hanging moon lights) brings you to the front door of your home away from home. A private queen bed nook, an open living area, a full bath, and a back porch provide the downstairs living experience. Up a two-tiered loft ladder, 4 twin beds and a darling half bath await the more adventurous up above. Our own signature Canopy Kitchenette (TM) rounds out the experience. The back porch has a very simple kitchen that includes a stainless wash sink, concrete countertop, toaster, and a gas grill with side burner, all elegantly covered in the shade of an oversized umbrella. Dine upon our custom built-in fold-down table and antique wooden chairs. Le Petite Chateau' combines the greatest of all vacation experiences - cooking outdoors with charming shelter to boot, cozy spaces for family fun, romance and the perfect home base to quickly access all the excitement that awaits in this enchanting mountain and valley that surrounds The Candlelight Forest. All of this is only minutes from vibrant Chattanooga. Our Canopy Kitchenette (TM) provides a fun outdoor cooking experience on the back porch. Complete with a sink, countertop, granite prep surface, toaster oven, and gas grill with a side burner. Cane pole and simple tackle provided at Lake Angela - please bring your own bait, our fish are hungry! Great spot. The grandkids loved climbing upstairs to their beds. Convenient to so much! This treehouse experience is for all ages to enjoy! If you are looking for a change from the routine hotel/condo experience, this is it! My family had an amazing time and we can’t wait to go back! Amazing! Great for children and adults! This treehouse is great! It may seem small at first, but it is the perfect size for a perfect vacation! The upstairs has 4 beds, and is great for kids like me! If you don't have kids, this is a perfect hang out place! My family stayed here for 2 days, and I have already fallen in love with it! There is also a creek that was so much fun for my brothers and I to play in, and a large rope swing nearby that we went by 2 times a day! There are also so many hiking trails nearby to visit; it is the vacation place of my dreams! This is a hidden gem! We spent fall break here, & will be coming back! 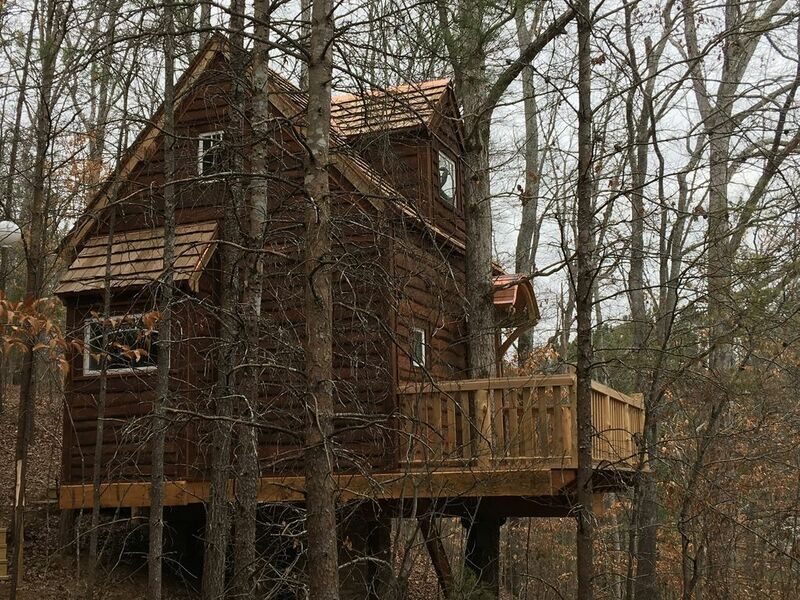 From the beautiful treehouse to the lake, hiking, & our favorite playing in the treehouse built by The Treehouse Master (just happens to be our sons favorite show on Animal Planet)it was an outstanding get away! Angie was fantastic to deal with & we just happen to be under a tropical storm warning so she worked with is to arrange another night! I would highly recommend this for a family or girls getaway as Chattanooga is 20 min it's away with lots of shopping & restaurants! Me, my wife and two kids (8&9) are tough critics, but, in short, we'll be back here for sure! My wife and I have been "in the industry" (architecture, construction, development, real estate (leasing, marketing, sales, etc)), for the majority of each of our individual careers. Me having gotten my degree in Architecture back in '86, plus 15-20 years of hands-on construction, then have spent my last 20+ years as an "Owners' Representative", the basic premise of which is watching for details, thinking of how to do things "out side the box" with an eye to Budget, Schedule, Function, and desired Aesthetic on behalf of Owners' of many different project types. My wife, while not having the same background as I, still has a similar eye for aesthetics and constructability. Resultantly, we are extraordinary aware and critical of our built (and natural) surroundings. We cannot go ANYWHERE without observing every detail and how things were done. I have to tell you that Heather and I are extraordinarily "taken" by your location, your concept, the architecture, and your interior design. All are REALLY well thought out Angie. "Hat's off". I mean like a ladder turned sideways, cut to fit between to pieces of, I'm guessing chamfered cedar 1"x6", w/ black-iron sprinkler piping for a curtain rod to screen the downstairs bed??? How creative!! REALLY nice. And the antique 1/2-window, with working handle / throw-lock rods, mirrored and then hung on a crack-finished bathroom door - brilliant! Then the flagstone floor and curb of the shower is a really nice "back to nature" touch, not to mention, everything maintaining the genuine feeling of being in a (very livable) treehouse. Only suggestion that is sometimes a nice thing in a place like this, even in today's technological world, or maybe exactly BECAUSE of today's technological world, I would love to have made a MANUAL entry (with actual writing utensil [we remember those, right? ]), in a "Guest Log", or "Journal" that you would leave in your lovely little, perfect, hideaways for all read, share, enjoy and take part in, if they are so inclined. We are looking forward to our last few nights here and will surely look forward to a return trip in the future.